The year was 1988. A Sunday morning. I was sitting where I sat every Sunday morning, being the son of a Southern Baptist pastor: third pew from the front, left side. I was a comic book collector in those heady high school days, and my father had taken me to a comic convention the previous afternoon. It was not my first convention, and yet I made a rookie mistake: I forgot to scrub off the hand stamp that I had gotten at the gate. My heart did not start again for several minutes. Angie was smiling—that cheered me—but I imagined her smile shrinking if I told her I had been at a comic convention. Comics were dweebish, a trait I already possessed thanks to glasses and straight A’s and memorizing the Bible, as preachers’ kids are known to do. And yet I couldn’t lie to her, not with an active fantasy of her becoming my girlfriend. So I said it. I disgorged the truth: “Comic convention.” Her smile didn’t shrink, nor did it grow. A terrible stasis was achieved. We turned away from each other, facing the front of the church, and she never did go out with me. That scene wouldn’t happen today. Comic books are big now, as is the science fiction genre. Fantasy. Video games. Cartoon Network. Anime. Fan fiction. The convention I went to in 1988 occupied a single hotel ballroom. Now, shows such as New York Comic Con draw 100,000-plus attendees who stand in line for celebrity autographs, talk in their fandom’s lingo, dress and act like their favorite characters—this is called cosplay—and occasionally name their children after them (my daughter is Michaela, after Michaela Quinn in Doctor Quinn, Medicine Woman). Such are the workings of fandom, a once-niche lifestyle that has become mainstream in the last decade. Fan behavior is inherently literary, which is why librarians need to know about it. Here, then, is a primer on fandom. You can’t learn about a subject until you know what its words mean. Ship? This is not a seagoing vessel. AU? Not the chemical symbol for gold. OTP? Not a Naughty by Nature song. These terms have specific meanings in the world of fandom. A longer list of terms is over at The Geeky Mormon (thegeekymormon.com/primer-online-fandom-slang), where you can also read the author’s musing on specific fandoms such as Star Wars, Harry Potter, and Doctor Who. And a still longer list can be found at The Daily Dot (dailydot.com/society/ how-to-speak-fangirl). Fandom jargon changes too quickly to keep up with, so if you get overwhelmed, it’s OK. You won’t encounter most of these terms unless you read or write fan fiction—which is a big part of the fandom lifestyle, so I guess I need to talk about it. Where are my Star Trek fans? Are you out there? Good. I have a question for you. Did you ever wonder what would have happened if Kirk and Spock, instead of just being crewmates, had been friends? Close friends? Reeeeeeally close friends? If so, you’re not alone. Modern fan fiction (aka fanfic), or the practice of writing original stories using established characters and worlds, is generally thought to have begun with Kirk and Spock ships. These stories appeared in fan-publish- ed newsletters, or zines, through out the 1970s. Now, fans write fanfic based on books, movies, anime, games, celebrities—anything. Some of it becomes commercially successful—Fifty Shades of Grey famously began as Twilight fanfic—but most is written, and should be read, as a lark. FanFiction.Net (fanfiction.net) has the biggest collection of stories. Created in 1998, the site has more than 2 million users who have posted nearly 8 million pages of text in 30-plus languages. If you like fan art as well as fiction, DeviantArt (deviantart.com) has more than 246 million works. Other sites are available at Ebook Friendly (ebookfriendly.com/fan-fiction-websites). Fanfic is one of the most intimate ways to show devotion to a particular fandom, but it does have its critics. The most strident ones raise questions of copyright. Fandom in the Academy (charityfowler.com) discusses fair use in relation to fanfic, but the real question is, what do authors think of having their worlds mimicked and messed with? In 2016, I heard George R.R. Martin speak at a convention, and when someone asked him about Game of Thrones fanfic, he said he never reads it (for legal reasons) and that it isn’t a good way to learn to write as it limits the imagination to what someone else has already thought up. Others, however, see a lot of value in fanfic, both for writers and the creators of the source material. The terrific Fanlore (fanlore.org/wiki/Professional_Author_Fanfic_Policies) summarizes the feelings of dozens of authors on the subject. When I say George R.R. Martin was at a convention, what do I mean? The Republican National Convention? (Nope. He made his opinion of the president pretty clear at grrm.livejournal.com/506110.html.) I mean a science fiction convention. Usually spanning a weekend, sci-fi conventions have literary panels, writer guests of honor, cosplay contests, dealers who sell fabulous stuff, music festivals (sometimes), lots of drinking (except Romulan ale, which is outlawed), and plenty of fun. There are also comic book conventions, anime conventions, gaming conventions, horror conventions—you name it, there’s a convention for it. 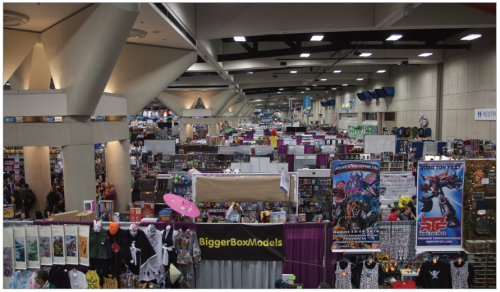 Conventions are the epicenter of fandom, and Convention Scene (conventionscene.com) is a clearinghouse of convention listings and information. Plus it has reports on specific conventions. I have written a few (conventionscene.com/author/pisancantos), as has my daughter, Michaela (conventionscene.com/ author/ilovebeingfluffy). Suppose you’re interested in going to a convention. Which one should you go to? This list (therichest.com/rich-list/the-biggest/the-worlds-20-biggest-geek-conventions) of the 20 largest conventions is a good place to start. (Warning: The numbers are a little outdated. Dragon Con topped 70,000 in attendance in 2016.) 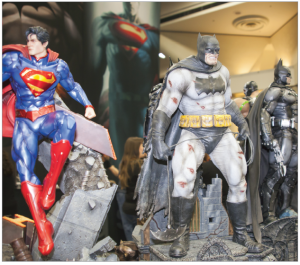 As for how you should prepare, this article (laweekly.com/arts/14-essential-items-to-bring-to-every-fan-convention-2370103) covers such things as sharpies, sunscreen, and a sewing kit. Why, you ask, would a person take a sewing kit to a convention? Cosplay repair, naturally. Cosplay, a portmanteau of “costume play,” is not dress-up, not Halloween. Fans can spend thousands of dollars perfecting an outfit, and when they wear it to a convention, they take on the persona of their character. Call it method acting lite. Conventions usually have cosplay contests, with different levels of proficiency. At the highest level, the rule is often that every part of the outfit must be handmade. Cosplay has gotten mainstream in recent years thanks to magazines (Cosplay Culture, Cosplay Gen, and iCosplay) and shows such as Heroes of Cosplay (syfy.com/heroesofcosplay). Google “cosplay,” and you’ll see some incredible images. This site (xomia.com/cosplay-101-tutorials-and-tips) offers tutorials, tips, and tricks for beginning cosplayers. And, yes, you can make a career of it: thehustle.co/meet-the-girls-making-a-living-from-cosplay. Fanfic has existed as long as writing has existed, but cosplay is a fairly recent phenomenon. I would call it the most fannish thing that fans do. Some sources call cosplay performance art, and I agree. Someone should study the behavior of people who, instead of writing about characters, actually become one. In fact, someone does study such behavior. A lot of someones. In 2012, the Fan Studies Network (fanstudies.org) “was created with the idea of cultivating an international friendly space in which scholars of fandom could easily forge connections with other academics in the field, and discuss the latest topics within fan studies.” Those topics include fan stereotypes, fan jargon, fandom as pathology, research methods, the history of fandom, online versus offline, fandom and sexual orientation—you get the idea. The network has hundreds of members, a quarterly journal, and an annual conference. (A conference for people who study convention-goers? That’s meta.) One of those members is Henry Jenkins, considered one of the founders of fan studies. His blog (henryjenkins.org) is practically a textbook on the field, with links to the Convergence Culture Consortium, Neil Gaiman, and more. Academics are often dry, but Jenkins writes with verve. If you read his work, you might become a fan of fan studies. The defining characteristic of [being a fan] is that we love things. Some of us love Firefly and some of us love Game of Thrones, or Star Trek, or Star Wars, or anime, or games, or fantasy, or science fiction. Some of us love completely different things. But we all love those things SO much that we travel for thousands of miles. We come from all over the world, so that we can be around people who love the things the way that we love them. This is why librarians need to know about fandom. We are the custodians of the science, the reading, the fashion design, and the stories and pictures that fans love, that people love. I can think of no more urgent or awesome responsibility. Anthony Aycock is the author of The Accidental Law Librarian (Information Today, Inc., 2013). A former law librarian, he now works at a law enforcement training academy. He has a B.A. in English, an M.F.A. in creative writing, an M.L.I.S., and an M.A. in criminal justice. Send your comments about this article to itletters@infotoday.com.